The G1 is Logitech entry level to their new gaming series of mice. 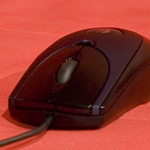 It has the same small shape as the MX300 and previous Logitech mice, perfect for left or right-handers. Like the MX300, it has four buttons, the usual left/right/wheel plus one positioned just behind the wheel. 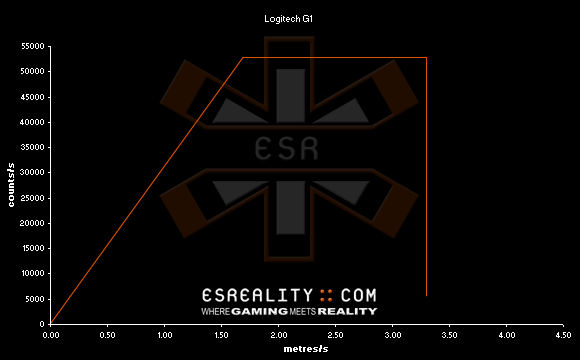 The G1 weighs in at a resolution of 800 DPI according to Logitech's specs. The body is made up of a gloss black plastic, with a feature inset of pleasing metallic dark blue near the buttons. The buttons are made of the same gloss black, so Logitech don't believe rubber buttons like Razer's are the way to go for gamers. 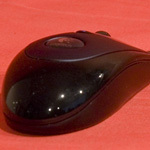 The Logitech logo is in a small rubber bubble. 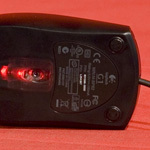 on the top, and the side panels are a slightly transparent black colour, to show a red glow from the main optical sensor. Perfect Control ends at 1.68 m/s (66"/s), followed by a clipped response up to the Malfunction Speed of 3.30 m/s (130"/s). The gradient of the linear part shows the resolution to be 800 DPI as expected. Again I tried overclocking the USB port to improve performance but there was no change. Like many other of the recent optical gaming mice, the G1 doesn't skip until very fast speeds way beyond what normal gamers would hit. However it also has the response clipped which means it only has Perfect Control up to a smaller speed of 1.68 m/s. This isn't the end of the world though, as gamers are unlikely to hit this speed too often unless they have very low sensitivities. The G1 is a good looking mouse with good performance and an improved resolution of 800 DPI, making it perfect for players with High or Low Sens. It's extremely lightweight at just 80g and won't skip no matter how fast you flick it around in normal gameplay.